Velvet Paw Creations: Day 10: 12 Days of Creepmas with Smeared & Smudged! Day 10: 12 Days of Creepmas with Smeared & Smudged! I'm embracing my darker side this year and participating in Smeared and Smudged forum's annual 12 Days of Creepmas blog hop as a Jolly Blogger! 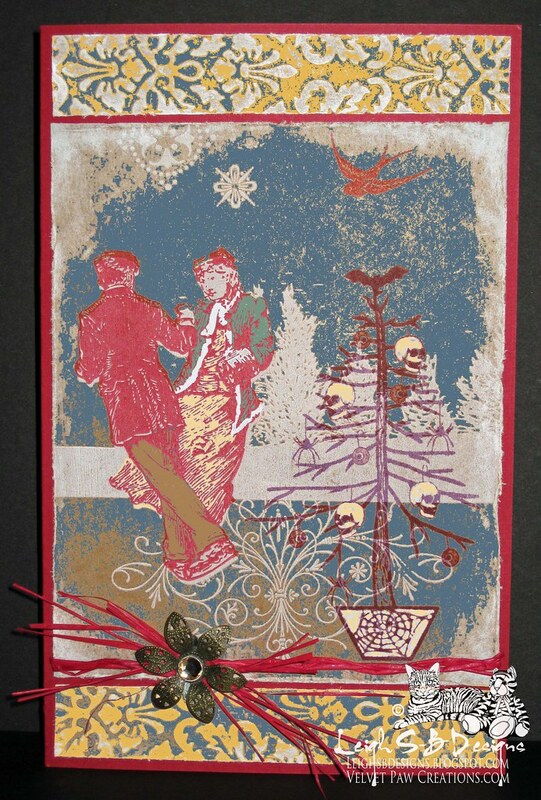 Today I've got an upcycled, stamped and digitally altered Creepmas card to share! The above photo shows the finished card after I did some digital manipulation in Photoshop for the new Smudgy Antics Colour Challenge. I love how it turned out but I also love how it started out too which you can see in the photo below. Which do you prefer of the two? I cut up the paper bag and stamped the Creepmas Tree by Smeared Ink with Aged Mahogany Distress Ink onto the portion of the image I decided to use and coloured with Picket Fence and Fired Brick Distress Markers. I distressed the edges of the panel with Tim's paper distresser tool and applied VersaMagic Cloud White to the edges with a foam ink applicator tool. I made a tall folded card from deep red cardstock and then cut two narrow panels from blank sections of the paper bag to fit the spaces along the top and bottom edges of the red card. I embossed the two pieces with a Cuttlebug embossing folder, distressed the edges too and then applied VersaMagic Cloud White to the embossed design with a foam ink applicator. Before adhering all the panels to the red card I adhered a few strands of red raffia to the the main panel and tied a knot on the left side of the panel and embellished with a metal poinsettia with a topaz jewel in the center. wow...fantastic card(s) Leigh! Love both versions...I'm getting photoshop for Christmas and can't wait to learn how to use it. I so admire those of you who do digital work! I see a trip to Trader Joe's in my future! 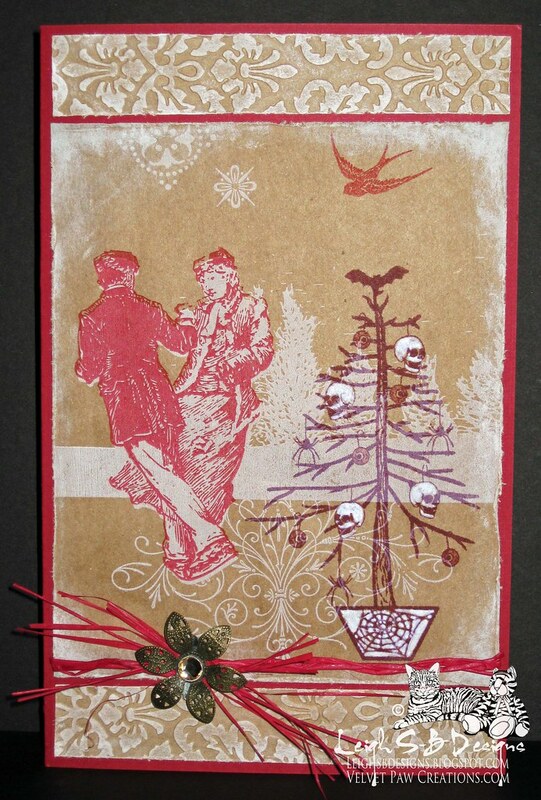 Fab card, love that it was recycled :) Very cool how you altered it in photoshop too. very creative, leigh :) It turned out great! Ohhh this is soo cool! Love the images and the colors! Fabulous! 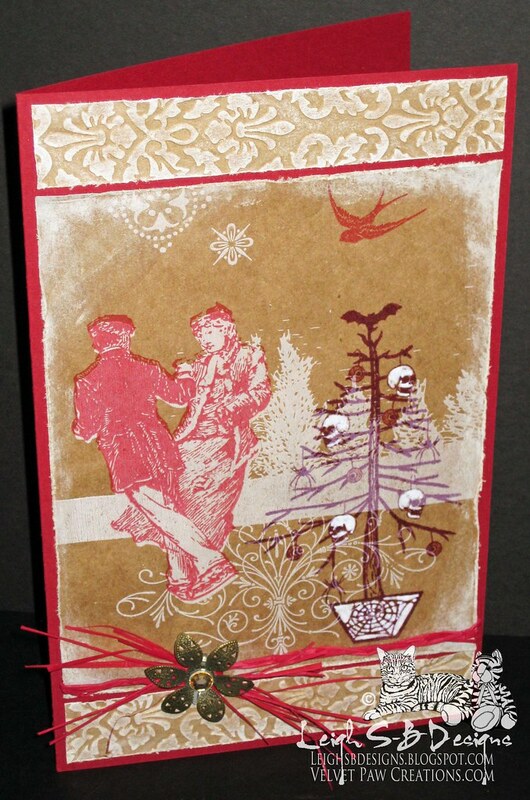 Fabulous card and wonderful color manipulations! I can't pick a favorite. Both cards are awesome in their own ways! Thanks for playing with Smudgy Antics :) BTW, your email did go through. I'll make sure Tori sees the message. Happy Holidays! Wonderful card, love the images! simply wonderful. Love the way you meshed the colors and added the tree. marvelous. Thanks for sharing with us at Smudgy antics. It looks fab with the colors. thank you for sharing at smudgy antics!